It was a poignant moment for Balamdina Ekka, widow of Lance Naik Albert Ekka, martyred in the 1971 Bangladesh Liberation War and awarded India’s highest gallantry decoration, the Param Vir Chakra, as she visited her husband’s burial site after 45 years and collected soil to take back home. It was a journey of faith to remove a doubt that had arisen last year after an urn containing soil from the graveyard was handed over to Ekka’s family, who doubted its authenticity. A 12-member team, including Balamdina Ekka, her son Vincent Ekka and daughter-in-law Rajni Ekka, came here earlier this week from Jharkhand’s Gumla district to pay homage at Sripalli village in Dukli, 15 km south of Agartala, where Albert Ekka of the 14 Guards Regiment of the Indian Army and 10 other soldiers were laid to rest. They had died in a fierce battle to capture an advance post of the Pakistan Army at Gangasagar (opposite Agartala city) in Brahmanbarhia district of what was then East Pakistan. Local villagers led by Bhuban Das had erected and protected a small memorial at Sripalli in memory of the 11 soldiers. Ekka was then 28 years old and had served for nine years. “Since 1971, every year on Vijay Diwas, we respectfully garland the memorial and will continue to do so,” Das told IANS. Not only was Ekka posthumously awarded the Param Vir Chakra, Bangladesh conferred on him the Friends of Liberation War honour for his “outstanding support and sacrifice to the 1971 war as a foreigner”. On India’s 50th Republic Day on Jan 26, 2000, the government issued a postal stamp in his memory. “I have collected the holy soil from my husband’s graveyard and want to build a memorial in my Jari village so that people remember the sacrifice of Albert Ekka forever. I am very happy and all my doubts over the death are over,” said 73-year old Balamdina. He said that they would perform similar rituals in Gangasagar. “We have collected the sacred earth from the spot that the elderly locals have identified as my father’s graveyard… The army and the Jharkhand government have helped us a lot,” said Vincent Ekka, who is a clerk at the Param Vir Chakra Albert Ekka block in Gumla district named after his late father. Last November, the Jharkhand government, with the help of the Indian Army, collected the soil from the graveyard and sent it to his family. But controversy erupted after Jharkhand Chief Minister Raghubar Das handed over the urn, with Ekka’s family raising “doubts” over the authenticity of the “sacred soil”. 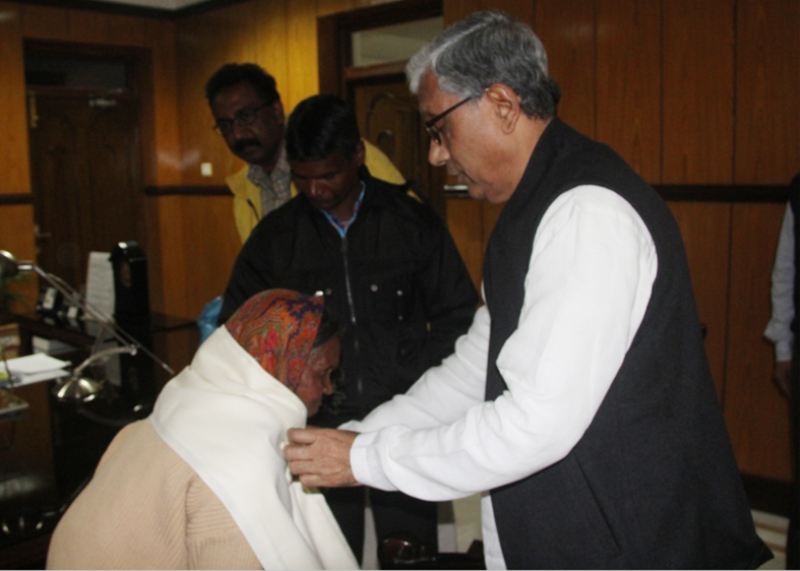 To remove the doubts, the team, led by Jharkhand tribal advisory committee member Ratan Tirkey and Jharkhand protocol officer George Kuma, met Tripura Chief Minister Manik Sarkar and explained the purpose of their visit.